In the business world today, the computer and the internet are playing major roles. Businesses benefit from these in several ways such as the preparation and preservation of databases, development and uploading of the business website, development of specific software and so many others useful for marketing and advertisement. These days the social media networking is overtaking the traditional methods in marketing and advertisement. Social media is a new method of marketing and advertisement based on social interaction. 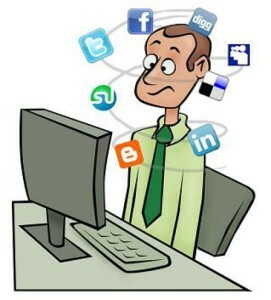 The social media marketing is also based on the internet and the computer. An internet based technologies are used to advertise and market goods and services. In the last few years this advertisement method had so much imparted on the world of business that there is the democratization of information and knowledge. Many people are transformed to content producers. This is because of the spiral effects of the social marketing sites. Social media use new methods of communication to reach the consumers of goods and services. In the business world it has ignited a new fighting spirit because, both the small businesses and big businesses compete. It offers the small businesses the opportunity to grow while the big companies widen their businesses. The major benefits of these social media are the spiral effects it has in the world of business and advertisement. Some of the social media sites include Facebook, MySpace, Twitter, LinkedIn and several others. They offer businesses different methods to reach out to the global market. Advertisers now offer their advertisement in multiple of languages. These social media sites are such popular that even kids and family members have an account with them. Facebook is the second most visited website in the world. Here are some of the reasons these social media sites the best platforms for advertisers. It is used in the planning for businesses. It is easy to get at the audience once the business has an account with any of the social media sites. These days one could easily purchase friends. It is easy to make friends and generate followers. Businesses could get the right audience and target them by creating groups. The business owner could create a business page on Facebook. For any business owner to use the social media for advertisement, he must be visiting the business page regularly and interact with the members and friends. He would answer all their queries. It is the most cost effective method of advertisement. Many people rely on them because some of the methods they use do not cost anything. It will cost time and dedication. The advertiser must have internet access and computer. These are the cost. With hard work, the business would spread to all parts of the world through the networking system. To broaden the advertisement, businesses must rely on the social media websites. These sites bring new customers through the business page visitations. New visitors to the business page could be achieved through other means such as links and referrals from other sites. It offers advertisers the opportunity to broaden and explain the business through direct conversations with their page visitors. For the internet marketer to succeed with the social media he must take care of his customers and business page visitors.